We all know that our children should be spending more time outside: it can help to make them fitter and happier, and it can help to instil a life-long appreciation of the natural world. But, a 2016 study by Natural England found that one in nine children had not visited a park, forest, beach, or other natural environment once in the previous 12 months, suggesting that for many of us, spending time exploring the great outdoors with our kids simply isn’t a priority. If you’re determined to help your children spend less time in the digital world, and more time enjoying the fresh air, then I’ve shared my top tips you get your kids excited about spending time outside. Whether it’s for their first walking holiday, or just a family hike out in the hills, read on to learn how you can encourage your children to put on their walking boots and get active this summer. While grown-ups might relish the prospect of a day spent walking in the countryside, our kids are often less keen. For the most part, this reluctance to embrace long walks boils down to a simple issue: they’re afraid it will be boring. 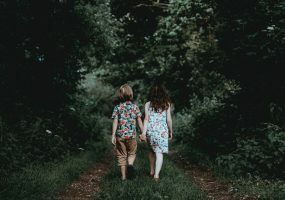 So, if you’re often met with sullen expressions or temper tantrums when you suggest a walk, then it could be because you need to reconsider how you introduce the topic to your children. Instead of telling the kids that you’re all going for a long walk, say you’re going on an adventure into the wilderness make it more exciting: keeping the focus on fun is sure to drum up some enthusiasm. For longer walks and hikes, don’t be afraid to take a slightly more imaginative approach, like turning your outing into treasure hunt or orienteering exercise, for example. Even if you hope to turn your little ones into intrepid adventurers over the course of the summer holidays, there’s no point expecting your kids to scale Ben Nevis on their first ever hike (at least not unless you fancy carrying them on your back for most of the day). So, start small, and set realistic goals that suit your children’s age and experience level. Younger children won’t be able to tackle difficult, uneven terrains or long distances, so begin your outdoor adventure with some level routes on well-maintained trails. If you’re feeling ambitious and want to encourage your kids to make faster progress, then a star chart is a great way to turn your walks or rides into a regular activity. Set a target for the total number of miles you want to cover over the course of the summer holidays, then award your children a star for every mile they achieve. Once you’ve reached your family goal, treat them to a day-out of their choice as a reward. Children tend to be fair weather walkers, and nothing puts a dampener on their spirits like being cold and wet. So, you’ll want to make sure they’re decked out in plenty of layers, and, most importantly, ensure they’ve got a pair of comfortable and hard-wearing walking boots to stave off complaints of sore feet. If you’ll be venturing out in all weathers, then a lightweight portable anorak and some puddle-proof boots will be invaluable. Treating the kids to some stylish kit can also be a great way to encourage reluctant walkers out into the fresh air. Older children often associate walking or biking with naff anoraks, so investing in some swish new outdoor clothing and shoes can be a great way to persuade them that getting active can be cool. Sometimes, nothing is quite as effective as some good, old-fashioned bribery. The promise of an ice cream at the end of a long walk can be a very effective motivator if you’re having difficulty encouraging your kids to pick their feet up, and it’s a small price to pay for good behaviour during your walk. Of course, if you’ll be walking regularly, incentives don’t always need to involve sweet treats and unhealthy snacks. If possible, make the end point of your adventure a visit to a playground or other fun activity: this way, your kids will have something to keep them going. Just make sure it’s not too much of a slog back to your house or car afterwards, or you might find your little ones are rather sapped for energy after half an hour on the swings. Long car journeys can tire children out, so it’s a great idea to start your summer of outdoor adventures as close to home as possible. The Chilterns Area of Outstanding Natural Beauty is full of trails suitable for children of every age and fitness level. The route at Aston Rowant in the Vale of Aylesbury has wide, accessible pathways and lots of wildlife to look out for, so it’s perfect for families with younger children. Or, if you’ve got a budding history buff in the family, the Iron Age Fort Walk, which runs right past an impressive prehistoric settlement, is sure to pique their interest. As you can see, there are plenty of ways you can encourage your children to spend some quality time with you in the great outdoors. Now you should be all set for successful summer of walking and cycling that your children will remember for years to come! Macs Adventure is an international group of people and organisations. We have over 65 staff from more than 12 countries around the world. From our humble beginnings in 2003, we have continued to grow at a remarkable pace. The company has offices in Glasgow, UK, Saarbrücken in Germany and Boulder, Colorado in the US.